It is monsoon season in Las Vegas. I love the rain. It is beautiful, and smells great. My son hates the thunder and lightning, but I could live in a place where it rains every day, except for the fact that barometric pressure changes cause mega migraines in my brain. They are the awful, don’t talk to me, touch me, or allow light in type. I hate them, I am learning to control them, but the random rain makes it harder. During this time of crazy rain and migraines, we received an opportunity to visit Wet N’ Wild and review our experience there. We are in the midst of declaring bankruptcy so this was an extra special treat for my family. We tried to go several days, but illness and rain joined to prevent it, but finally last Friday, we were able to go as a family. It was a great concurrence of beautiful weather, fun family time, and a great evening! We went on a movie night, but ended up in the lazy river instead of watching the movie. My son was tired, but he even let me go around the lazy river on a tube on my own. It was relaxing and wonderful! We also joined up with my brother and his family who have season passes. They love it and go about twice a week! Swimming with cousins, riding the tubes and slides, and playing in the water was a blast. We were exhausted when we finally went home, but it was definitely a night to remember. Here are my husband’s thoughts. 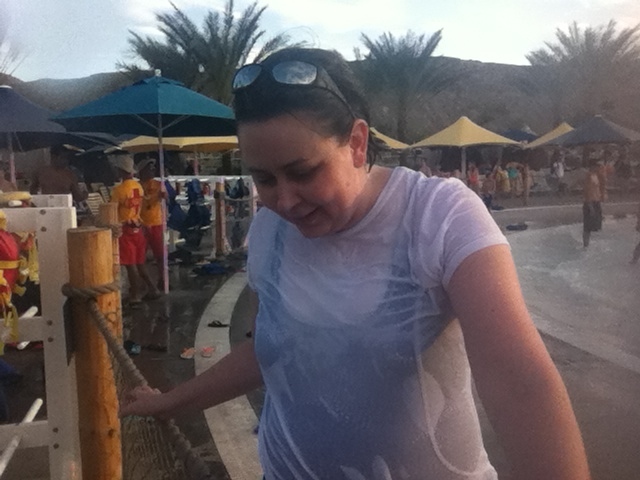 . .
My wife took us to Wet N’ Wild for her blog so that we could review it for her. Let me say, that was awesome. My son and I were given the express pass wrist bands to use. My son is 9 and has no fear of rides. We went on every major ride in the park. I must say that if you have the money the express pass can get you on everything in a very short time. We rode all the major rides in under 2 hours. 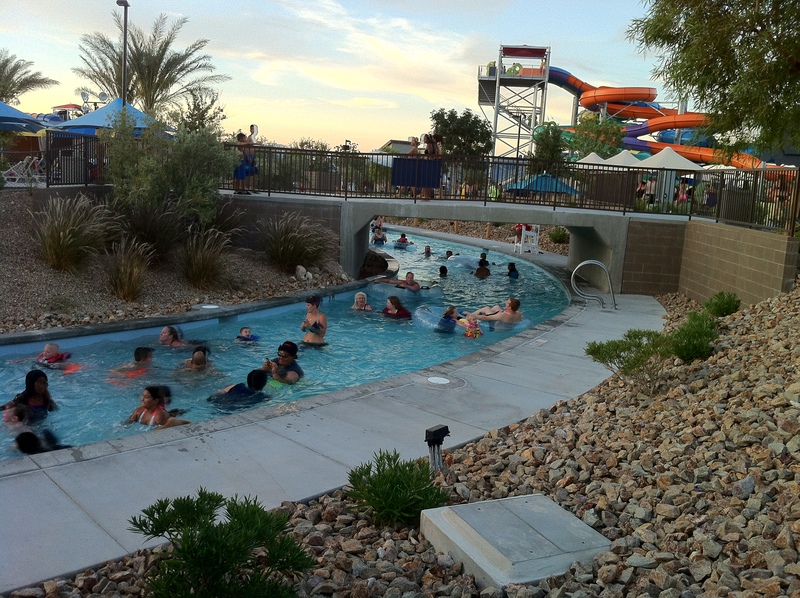 Wet N’ Wild is a great place for the family. Those that want to take it easy can float the lazy river to their heart’s content. Those that want adventure can fall off a cliff (how did my son convince me to do that? ), get flushed down a drain, and float down so many twisty tunnels that you won’t get bored. The kids zone is well designed so your children can ride safe slides, stay well protected, and a parent can still enjoy the area as well. The Dive in Movie needs a little work. You can hardly hear or see the movie in the wave pool. 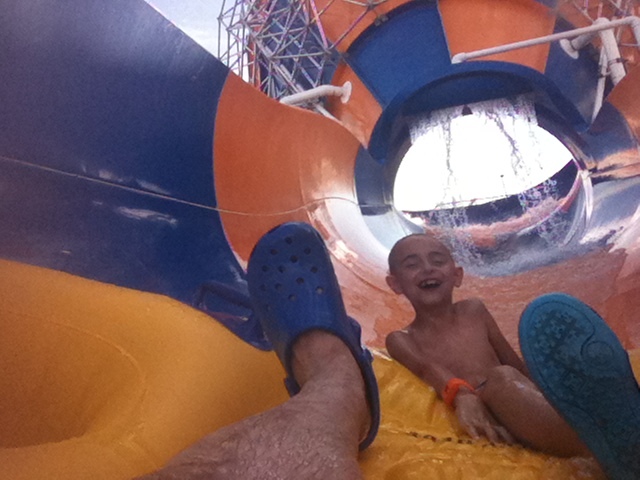 Over all, the trip to Wet N’ Wild was awesome for our family and the fast express passes were really fun to have. When our finances settle, and our son can run around with friends on his own, we will own season passes! It was a ton of fun, with something for everyone. I cannot ride major rides or dive because of my brain surgery, but I was never bored, or felt left out. My laps around the lazy river were relaxing and energizing. I had time to think about the things I love, and my son commented that he loved spending time with family out doing things. In the heat of the summer, swimming is an ideal family activity, and I have a little fish. We loved our trip and thank the Life Guards and other staff at Wet N’ Wild for a fun experience!